PBS&J creates innovative solutions by focusing on efficiency, constructability, and long life. New Pennsylvania Turnpike Bridge balances aesthetics, economy, and environmental sensitivity. Integrating Art and Engineering in Public Infrastructure. Constant-depth bottom flanges on precast concrete U-girders were converted to a variable depth at the site to reduce fabrication and transportation costs. Precast segmental construction offered the most advantages and was the most attractive option. 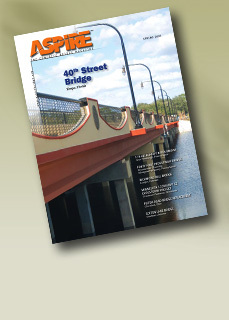 Combination of local government and developers produces decorative, cost-efficient bridge design.